Pyrrhus split from the SeaWing and followed the EarthWing that had sent him flying instead. Then he saw it. Their was some extremely odd structures around him. All had been well until he heard one thing, the sound of the earth underneath him start to give way and tear a hole. Pyrrhus fell into the depths of the earth, hitting the hard surface underneath him with a thud. It didn't seem to be made out of stone... Then he heard it. Something sounded like it was stirring from its sleep. Pyrrhus froze still for a bit, before deciding to venture further. The tail which the Reptilian had the misfortune of tripping over, was in indeed that of a Dragon. But luckily, that Dragon didn't appear to notice, for he was still asleep. Well, he was as far as the Reptilian was concerned. In truth, Durval had heard the earth give way and felt the poor creature hit his tail. The ElderWing's head was facing away from the Reptilian, so he could open his amethyst colored eyes. With the little light that came through the hole, one would be able to see his features. He was about the size of the largest NightWing, but his coloring and build was that of a FireWing. His scales were dark red, with a few streaks of lighter red and orange on his underbelly. Just like Siris, he had seven patches along his body, each one representing the seven tribes in color. And his chest bore the same crest. His paws were webbed to allow him to swim, but he lacked gills for extended underwater travel. His tail was thick and strong, perfect for wielding the club on its end. He wore a mane of feathers and his head was adorned with curved horns--like a ram. Like all ElderWings, his eyes were adapted to the dark, he could live in extreme environments, and his scales changed colors at times. Durval snored to aid in the illusion that he was still sleeping. Then he closed his eyes again and turned over so he was facing his tail now. Ever so slightly, he opened one eye halfway so he could watch his visitor. Stella Watched and saw the reptilian and saw a larger dragon he stirred lightly and she darted toward Pyrrus getting by the reptilian to guard him just in case the dragon grew hostile. Pyrrhus had heard the giant dragon stir in his sleep, a tranquil light coming from its partially opened eye. He noticed that, but he hadn't noticed the EarthWing darting toward him. Frantically startled he sprang backwards onto the mysterious dragon. Panicked by the EarthWing and unknown to him he crawled backwards up the mysterious dragon's tail. He soon realized this as he was right before the hind legs of the dragon. He froze on its back petrified. Durval could just see, but definitely smell, a smallish Dragon in his den. But he was more focused on the Reptilian which had scurried onto his back. Perhaps he was scared of the Dragon, and rightly so. If only Durval could have chuckled then... But no, he had to maintain a restful facade. He did, however, allow his hind paw to raise and scratch at a nonexistent itch on his side. And then his head moved so it was facing the wall of the den. Finally, the ElderWing settled and seemed to still again with a sigh. In his mind, Durval snickered and wondered how he could mess with his visitors. Of course, when the time was right, he would reveal his wakefulness. But for now, there was so many ways he could have some fun while 'sleeping'. Stella Yelped at the larger dragon. She knew he was awake by how his breathing was. she didn't like the way this was, The dragon was huge compared to her and her magic was wearing down. she sighed and relaxed against the wall hoping to blend in. a few minutes went by and she dozed off on the wall. Pyrrhus tried to stand still as the dragon stirred awake. It didn't seem to notice him but started to scratch an itch with its hind leg. Pyrrhus fell on inbetween the underbelly of the dragon and the foot that was itching the spot. It finally came to rest on the ground and the dragon appeared to go back to sleep. Pyrrhus instantly began thinking of what he could do to get out, the other dragon was hiding and... 'Oh great...' Pyrrhus thought to himself as he noticed... His legs were stuck under the foot... and he was about to be crushed by the underbelly of the dragon... lovely. He could move his leg out closer to the underbelly, but the dragon could stirr in its sleep again and crush him. He could try and lift the foot and go the other way, but again most likely be crushed. He was in a bad position. It took all control the ElderWing had not to stir and look at the small Dragon that helped at him when he repositioned himself. Why she had done it, he wasn't sure, and then she simply went to sleep.. Durval could feel the Reptilian had fallen and was now laying beneath his paw. And if the ElderWing moved in just the right--or wrong, depending on how you look at it--way then he would be crushed. How interesting. But Durval didn't want to harm his visitor, yet he was having fun. "Oh, well. All good things must come to an end, eh?" Durval grasped the Reptilian with a front paw before lifting the hind one. He opened his eyes as he sat up and looked at the visitor. "You've gotten yourself into quite the predicament, haven't you? Well, don't worry, lad, Durval is here to help!" The ElderWing smiled and held the Reptilian up to get a better look at him. "My, you're a wee thing, aren't you? It's a wonder that fall didn't kill you. Oh! Where are my manners? I'm Durval, in case you're too shaken up to have heard that. As you can see, this here is me den. And this island you've been roamin' around on with yer lady friend, is called Daelorios. Grand name, isn't it? I didn't come up with it, but I'd love to meet the Dragon who did. Oh, I've done it again, ha-ha. Here I am jabbering on and you haven't even to me yer name yet." Stella woke and stared at Durval in a confused way but sat in wait the other dragons didn't know they where here so if any thing went wrong shed have to use her healing powers to fix the predicament but she felt that nothing bad would happen around this dragon. Wise this choice she did not know but hope for the best she will. The ElderWing placed the Reptilian on his head then started walking to the cave at the back of his den. "Hold on tight, now. We wouldn't want you to fall off. You're a quiet bunch, aren't you? Or maybe I just talk too much, ha-ha. Me mother used to say that, you know?" Durval stepped out of the cave and into the ruins of a palace. Vegetation hung from the ceiling and clung to the walls. Sunlight flooded in from holes in ceiling. Water cascaded down from spaces between support beams as small waterfalls. A stream fell from rocky steps leading from a hole in the wall. The very hole Durval emerged from. Ahead of him was a staircase; to the sides were stairs leading to an upper level which no longer existed. A third set lay ahead, in the shadow of arches. These led to a lower level, a massive cave system which housed the ElderWing city. Stalactites of varying lengths and sizes hung from the high ceiling. The floor was entirely submerged underwater, but earthen paths had been raised for those who didn't wish their paws to get wet. A grand and glittering palace fit for gods had been carved into the cave's wall. Along the other other walls were dens and places of storage. Directly across from the earthern ramps that led down into this place was the entrance to four more caves. Two were identical in design to the first, but smaller. They housed mostly dens and foilage. The contents of the other two were unknown, for they were blocked off. But two dens were located outside of each. "Welcome to the city of Ilos!" Durval said loud enough for everyone in the next cave to head him. He chuckled and started down the ramps. He looked over at the female Dragon. "Well, yer friend seems a little too shaken up to speak. So how's about we start with your name, eh?" "No sir just deep in thought," Stella said she wondered if she'd get to be as big as Durval one day compared to him she felt like a spec and quite helpless... She landed abruptly feeling the ground around her it was growing darker and she asked what stone this was politely. "I haven't felt stone so smooth," she said lightly and flew back to catch up with Pyyrhus and Durval. Not taking any mind of being called a worm, the calm-headed SeaWings replied gently, "I needed a break from the tribe and a new place to look for herbs. You were going somewhere so I followed. Just be careful who you talk to like that, I might just have to heal up your scars." She watched as he walked past them, going into the lake. Being a SeaWing she would have no problem with the water, she swam down with him, watched as he moved a rock to reveal a hidden tunnel under the water. She saw him slip into the tunnel and waited before herself went into it. The current was strong enough to carry her down and she stopped at the bottom, getting off in case Cuda came rushing down after her. She looked at the cave, then back at Siris. Was this where they lived, and were there other dragons? Siris looked at Shore Line and gave a light nod before turning his gaze to the pool behind them. He wondered if Barracuda would join them. Deciding she would probably do so in her own time, Siris looked at Shore Line once more. "Shall I show you our city?" The ElderWing walked to the end of the cave, which appeared to be a dead end. Siris lifted his left forepaw and pressed it against the wall. After a moment, a low rumbling could be heard as the wall lowered. It was a door, one which was guarded by two ElderWings. Siris walked out of the room and along the path to the next cave. "Leave the door open, we're expecting another visitor. A SeaWing, like this one," he said to the guards with a flick of his tail to indicate Shore Line. To her, he said, "We have a whole cave full of herbs I think you'll find fascinating." Siris stopped just outside a cave, the scent of different herbs wafting from it. He sat down, deciding he'd wait here while Shore Line looked around. If not for the fact that they were in a cave, one would think the entire room was made of plants. From the ceiling to the floor, there were herbs everywhere. The female SeaWing followed the ElderWing to what looked like a dead end. From watching earlier she thought it would just be another rock that would move but instead it was more. He pressed his paw to it and it moved down, as if by magic. The water dragon was intrigued by it. If someone wanted to rain this place, they'd have to know their way around. The smell of herbs drifted her way before he even spoke, and when he did she was to interested to hear him. She wandered into the room, finding it filled with herbs. She saw piles of hers in some places and others that were being grown underground. "How are you able to do all of this?" She asked in awe, picking up a leaf of some sorts and seeing how it was different from any that she's seen back at home. Looking around more she began to see some that she could recognize, but many were unknown to her. Blueclaw was currently hunting in the area with her pack. Exclaiming a few BARKS, ordering them to take wing to the sides but back a bit as they chased down a doe. Blueclaw rumbled a bit, the feathers along her head vibrating a bit as she showed her aggravation towards her pack as they didn't do what she said. She BARKED once more and let out a KRAAAAAWW. Telling them to stop it and listen. They finally did as told. 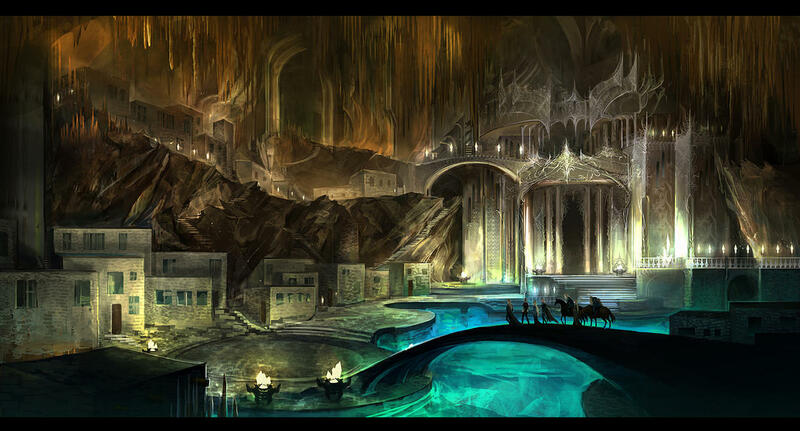 Siris smiled lightly as he watched Shore Line wander around the cave. Learning to grow herbs in places they didn't normally grow--or shouldn't be able to grow--was something all ElderWing Hatchlings had studied. But those destined to be Healers excelled at it. This cave was the result of centuries of trial and error. "What you see in piles, we gather everyday. What grows here, did not always. It took centuries of study and practice. Somewhere around here..." The ElderWing paused and looked around, as if expecting to find someone. And he was indeed looking for someone. Finally, he spotted her: the chief Healer, Laia. Siris stood and walked over to the Dragoness, who was currently gathering some moss and tree bark. "Laia, I'd like you to meet one of our visitors." Laia was just a few inches shorter than Siris. She had the same few traits and markings as all others of her kind. But her wings were membranous, her tail was not broadened, nor had she any gills. She did, however, have webbed paws.Her head was without horns, but instead had feathers in seven colors. Her scales were yellow with white splotches. She looked up from her stockpile of moss and bark to look at her friend and leader. With a smile, she lifted a paw to his shoulder as he did the same. "Hello, Siris. You're up early today. And we really have a visitor? That's new." The Healer looked over at Shore Line as Siris pointed to her. "Well hello, there! I'm Laia and all this around you is my doing. At least, it is when I tell the story." She smiled once again and followed Siris over to the SeaWing. Stella looked around the place seeing Durval she wondered will I be as big as him she shifted from flying to walking. The SeaWing almost missed the words the two dragons said, but looked over when she said this was her doing. The blue dragon noticed how she was a bit shorter than Siris, still had webbed paws but not gills, the feathers on her head were lined as if a crown, and her pale yellow blotches with white scales, or was it the other way around. The SeaWing was stunned, and while she might not have bowed to Siris she bowed to Laia, a short bow but a bow none the less. She grew this, gathered it, and have used it. "Hello, Laia, I'm Shore Line, healer of the SeaWings. What you have done here is amazing, I'd never have guessed that you could grow anything in the darkness of the underground, even though it doesn't seem that dark down here." Laia smiled at Shore Line and returned the small bow, even though she found it a little odd. ElderWings didn't bow to those who outranked them, even their leader. But she also found it interesting, how the mainland Dragons did things. "Hello, Shore Line. It's a pleasure to meet you. I thought you were a Healer; I can spot one a mile away. And thank you, although, I wasn't always very good at this. So, I'll bet you'd like to learn a few secrets, huh? I'd be happy to show you around more and teach you some things. If you don't mind, that is." Laia turned to look at Siris again. "And you don't have to stick around for that. I'll bring her to the banquet hall after we're done." Siris nodded and turned to leave, "We would be honored have you join us for a meal, Shore Line. The other visitors will be there as well, hopefully. And feel free to take any herbs here with you. There's more than enough to share." The ElderWing left and made his way to the main cave.